Aunty Lee, restaurant owner and busybody extraordinaire, is catering a lunch at a wealthy and prominent lawyer’s home in Singapore when two bodies are found – the lawyer and her ill son. Fingers point to Aunty Lee’s Ayam buah keluak, a dish made from the seeds of the Pangium edule, a plant which grows in mangrove swamps in Southeast Asia. 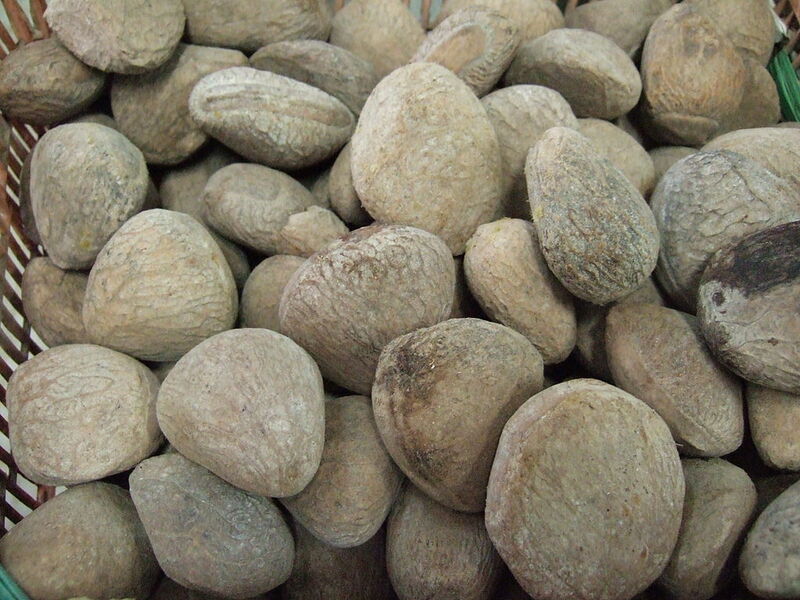 If not processed properly, which requires being boiled, scrubbed, soaked for days, it could make someone ill – dizziness, coma, shortness of breath! Yikes. Aunty Lee knows it has nothing to do with her food and that it is far more than what the police think. Plus this is all too much, in the way that it is affecting her livelihood, her passion. And that it might have something to do with the organ donor scandal that involves some rather prominent locals. So of course Aunty Lee, with her “kiasu, kaypoh, em zai see approach to food and all life”* takes matters into her own hands and begins poking around with the help of her trusty sidekick, her domestic helper Nina. Commissioner Raja and Inspector Salim are not please, but then again, they’re not really surprised either. For me, this series is not about the mystery, but its setting – Singapore. I have to admit that I was a bit bogged down by parts of the crime and the mystery, and wasn’t all that interested in figuring out whodunnit. Because there are not very many books set in Singapore or written by Singaporeans that make their way to the US, I lapped this one up like a bowl full of sweet sticky orhnee, a popular dessert in Singapore, and one of my absolute favourite desserts ever, a pudding of sorts made with mashed yam/taro and coconut milk, sometimes with ginkgo nuts and mashed pumpkin added in. Because sometimes there is a need to read about books set in a place you truly know well. Sure I’ve been in the US for five years now but I still feel like an outsider (as Sting once put it, “I’m an alien, I’m a legal alien”). To hear bits of Singlish, to read of characters like busybody Aunty Lee, to recognise places like Binjai Park and Bukit Timah Plaza, it means so much to me. It has been nearly a year since my last visit to Singapore. And Singapore being the fast-paced society that it is, every visit springs up something new (roads, buildings, skyscrapers, foodie trends), the disappearance of something old (sadly too common), and the realisation and understanding of the word ‘home’. Aunty Lee’s cooking and love for food is a huge attraction. The mere mention of Nasi lemak, herbal chicken soup, pineapple tarts, bubur terigu, oh ku kueh, made me drool, made me miss Singapore and all its gastronomic delights. Yu also includes some recipes, such as a chicken candlenut curry, as well as a guide to food spots in Singapore, for that complete experience. 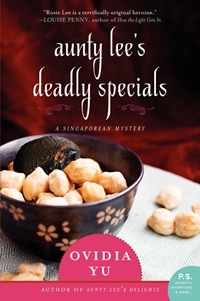 Read Aunty Lee’s Deadly Delights for some Singaporean-style flavour, both in terms of the food and setting. ← Previous Post Weekend Cooking: Hey pesto! Next Post → It’s Monday and I’m tired! I finally got my copy of this, & I am so looking forward to reading it! I loved the first one. So I only skimmed your post. I’ll be back to read it in full! I’m glad that the setting was so comfortable and enjoyable for you! Thanks for being a part of the tour.